Toni (Royalty Hightower) trains in the boxing gym with the boys in The Fits. She executes more sit-ups than I could dream of doing at this stage in my life—the same with pull-ups. Her jabs look mean. At an elementary age but breaching adolescence, however, she espies what all the other girls do at Lincoln Community Center: hip-hop–inflected drill dancing, and she decides to join up. The boys work out and the girls rehearse, but each group is sure to watch the other from afar to monitor and consider their crushes. At first, Toni slips between the two rec-center sects as an intermediary figure, hearing the older girls gossip about her handsome older brother, Jermaine (Da’Sean Minor). She initially grapples and struggles with the movements in the routines that her dance superiors choreograph. Her punches in the first routine she learns are, ironically, too punch-like, which elicited laughter at The Tower screening. As she gets the hang of it, though, a mysterious sickness spreads among the girls—and just the girls. Authorities test the water for contaminants, and in the meantime, one by one, girls lapse into jerking spasms that land them in ambulance rides to the hospital. Director Anna Rose Holmer shapes the world of The Fits as one that mostly children run (with the exception of the dance coach’s minor role). The dimness of the recreation facility and the bleak school-season weather remind of the blight of afterschool routines that children face and the excited conversation and imagination they engage to overcome it. Toni’s rote exercises and sheer physicality made me want to exercise (I hope Holmer received a health and fitness grant to help her with this film). Although Hightower performs a relatively silent, shy character, the value of her performance makes its home in her physical repetition of tasks as she coalesces her boxing athleticism and rhythmic dance moves. Much of the film’s vocabulary arises from Toni’s and the boys’ cocksure pitter-pattering and her and the girl’s akimbo stances. Hightower navigates the two physical codes and expresses her own synthesis with efficacy. Much of the humor in The Fits comes from a prevalent cuteness factor. Toni’s interactions with her chatty, newfound best friend are quite funny, and the two abscond to try on dance uniforms while the community center has been emptied for investigation of the sickness for some heartwarming laughs. One criticism I’ll offer about the film is that once the outbreak incites paranoia among the characters, the film drags a bit. The screenplay feels like it focuses on the fear of the unknown a bit longer than it should as the tension inches forward with each girl who falls victim to its bodily takeover. (Spoiler:) As the girls begin to mythologize the sickness and the girls who’ve experienced it, however, Holmer’s use of these “fits” as a transformative plot device works well. 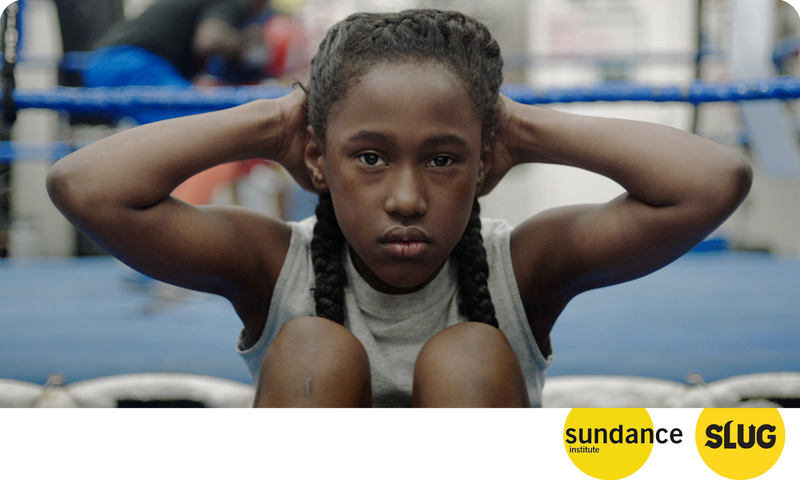 The Fits succeeds with Toni’s self-discovery among the culture that her peers comprise. Despite the lag that I mention, no moment feels boring or dull—the magic that uplifts children through everyday life translates through the screen. I found myself perceiving the events that transpire in The Fits with a childlike sense of suspense. Try to see this film at one of the screenings below. It’s in the “NEXT” section, so it may be your only opportunity.